Spending a day at the pool can be a fun and relaxing experience. But it typically means having to spend all day in the water, which can be rough on the skin and hair, and even a bit tiring. For this reason, many people choose to sit poolside in a lounge chair and watch the action. While this can be relaxing, it is nowhere near as exciting as actually being in the water all day. There are many kinds of floating chairs that can be used in the water, such as mesh backed chairs, and large pool bean bags that can hold almost anyone. Mesh backed chairs were once a popular choice. However, they often rust quickly, and can be very uncomfortable to use for extended periods of time because the mesh tends to sag. Another common problem is that they tend to lose their ability to float, or have to be repositioned after some time. These issues can be very frustrating to anyone who wants just to lean back and relax. Bean bags do not have this problem because they have an enclosed body that does not rust or sag, making it easier to stay afloat without any extra effort. Excess water can also drain out quickly thanks to the fabric used to make the floats. This mesh material makes it easy to dry the product once it has been removed from the pool. 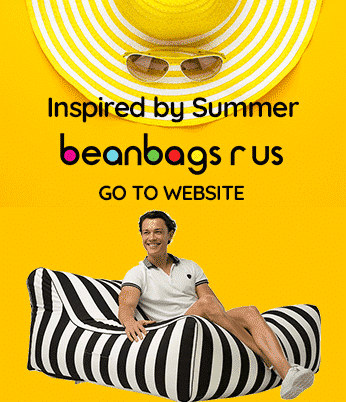 There are a number of creative and practical ways to use pool bean bags. For example, a small float can be used to hold items like glasses, pool toys, or even things like sunscreen or goggles. The float can even be used to hold towels, but it is important to put down a plastic layer first so that the towels do not get wet. The towels can also be stored in sealed plastic bags and placed on the float to stay dry until they are needed. Those who love to have pool parties may find that a small float is a perfect place to put snacks or drinks for guests to enjoy. One caution with this is that the food or drinks will need a stable place to sit. If the floating chair is used like this, always be sure to tether it to either a handrail or to somewhere stationary so that it does not end up tipping over or floating around too much. More practical uses for the bean bags include using them as the perfect reading spot in the water. To do this, carefully climb onto it and get comfortable. You may prefer to tether it to the railing or stairs so that it does not float away. Tethering is a good option for anyone who wants to be in the water but does not wish to move around a lot. Parents often choose this option when they want to be in the water with their children but still want to be within easy reach of the ledge. This option is handy in case they need to jump suddenly into the water or exit the swimming area. Those who prefer floating in the water may find it easier to climb on and use their feet to paddle themselves around. It is also possible to just relax and let the float move around on its own. Let Pets Join In On The Fun! Floats are not just for humans – pets can use them too! Many dogs, and sometimes even cats, enjoy resting on these floating cushions as a way to cool off on a hot day. The best way to do this is to allow the animal ample time to get used to being on the cushion. One easy tip for this is to keep it near the edge of the swimming area so that they can jump off onto dry land. If the animal is comfortable being on the cushion, it can be untied and allowed to float around. For some animals, this is relaxing, but always pay attention and watch for signs of distress. Another option is to get an oversized bean bag to relax on and coax animals into joining you on it. This option keeps them safe but also allows them a chance to be part of the action. And, of course, the final way for you or your pets to relax without getting wet is to use the pool bean bags on land. Many do this after they have had enough water for the day and just want a chance to unwind and dry off.